Never got around to posting about Card Catalog while it was in progress. I've written before about my affection for card catalogs, which developed in high school when I worked at a public library. I still work with books professionally, so this quilt seemed like a natural—especially since I wanted to try printing on fabric. The bibliographic data is genuine, downloaded from the British Library and the Library of Congress, though I had to fudge some of the lacking info to flesh the cards out (an embarrassing level of Dewey Decimal recall helped). I picked out several fonts that looked like catalog cards, some with a typewritten look, others dot matrix. The other blocks are various shades of brown to suggest catalog cabinets. I knew I wanted a wood-grain pattern for the brown rectangles, but I hadn't ever hand quilted—and that's where the Mother came in, with lessons over Christmas. Usually, the Mother told me, beginning quilters use polyester batting, thread the same color as the fabric, a regular design, and guide lines drawn on the fabric. Me, I went with cotton batting, contrasting thread, and a complicated, freehand design. Some of this was out of ignorance, but some was just because I'm too impatient to practice on a throwaway project before starting on the real stuff. 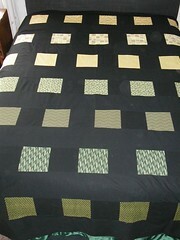 It took some time to get my stitches even too, but I was amazed how dense the quilting was by the end. And I love how the texture turned out. The grommets add a little bit of extra detail to a design that's essentially pretty simple. I'm thrilled with how it turned out. The quilt's seasonally appropriate, too, since it's evidently National Library Lovers Month. Peeling the inkjet fabric off their paper backings distorts everything. And frays the edges. I'm also convinced that what my PC tells me is 3.5 inches is actually a little less in the real, printed world. My printer will let me have a quarter-inch margin on three sides of a page, which I intended to use as the seam allowance, but in future I'll give the blocks some extra room to allow for threads to fray from the edges when the backing comes off. 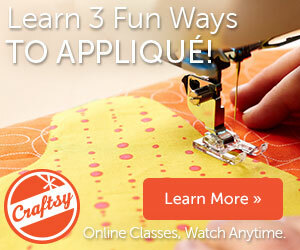 Hand quilting is hugely satisfying. A perfect excuse for plopping in front of the telly in the winter. Since my previous quilts were made from patterns and machine quilted by the Mother, it was very pleasing to finish a quilt I'd designed, pieced, and quilted entirely on my own. And the act of hand quilting itself is extremely relaxing and therapeutic, if a little rough on the middle finger of one's nondominant hand. A quarter-inch binding is plenty. The Mother insisted this was true, particularly for small quilts, but I wasn't sure I'd manage it. This binding turned out much crisper than my previous ones, both at the corners and along the edges, and it makes the whole quilt look more finished. There was one spot where the block was a little narrow and I had to fudge the binding a bit, so I'm working on more accurate seam allowances. Not every quilt has a home. I knew from growing up that quilts didn't have a purpose and that they quite easily overtook the space available to them. In my one-bedroom apartment, this one had nowhere to go. Eventually I stuck it up on the wall in an odd place, but it lets me admire my handiwork, so I'm happy. Since finishing the Card Catalog quilt, I've been working on this quilt for the Other, using fabric he picked out when I was in California. It's another quite simple design—I've only been piecing rectangles so far (I'm itching to try triangles)—but I staggered the grid to give it some movement. I'm calling it Assembly Line. The top is all pieced, but I'm going to appliqué a flamingo on in more greens and mustards. 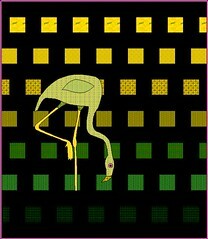 The binding and the eye will be flamingo pink, and I'm considering using the same pink for the quilting thread. I'm not entirely sure yet. For now, I just need to do a little playing about to work out how big I can make the flamingo with the fabric I have. I must reiterate how awesome the card catalog quilt is (i know i was lucky enough to see it in person, but it warrants a public comment as well)! Can't wait to see the finished bird for the Other. Really amazing project. Very nice work. This is the coolest thing I've seen in months! I love it!! 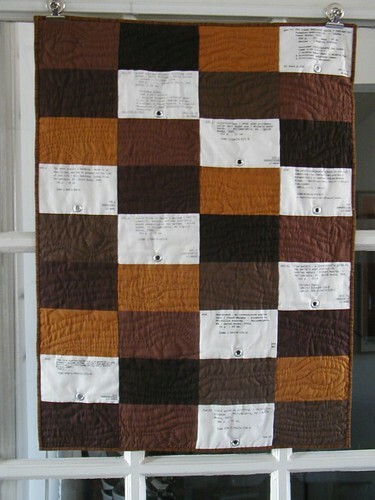 Great idea and beautiful quilt! I'm sure it will find a permanent home soon. What a great concept. I especially like the wood grain quilting, but I'm a big fan of card catalogs and their cabinets. I'm also glad there are other people who don't have time for "throwaway" projects, either. I feel like I learn more by trying something challenging right off the bat than I would if I tried something just for practice. Thanks everybody! The project was a great way to learn several new techniques, and I'm pleased to say that it's now found a happy home in our hallway, where visitors with or without MLS degrees can ogle it.